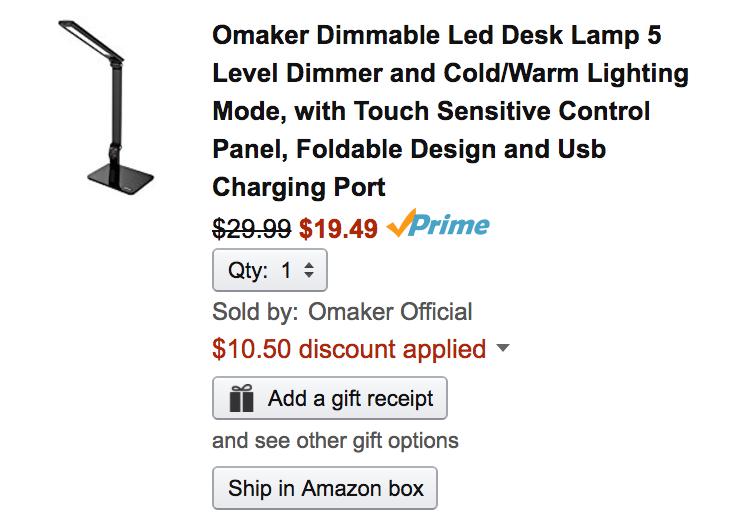 Omaker (100% positive feedback from 16,000+) via Amazon offers its Dimmable LED Desk Lamp w/ USB Charging Port for $19.49 Prime shipped when promo code 7URJYACU is applied during checkout. That’s as much as 33% off the regular price and $0.50 less than the previous Amazon all-time low. Rated 4.6/5 stars. Eyes-Caring – Glare is reduced providing uniform and natural, non-flickering soft light for a stress free ideal reading environment. Customize Task Lighting – Features convenient touch sensitive controls with cold/warm adjustable light color modes and five adjustable brightness/dimming levels. Stylish Foldable Design – 3-D adjustable arm that enables you to direct light wherever you need it ,you can just fold it while not using for saving space. Eco-Friendly – With a LED bulb lifespan of over 50,000 hours, you will never need to worry about changing a light bulb again. Innovative Photoconductive Technology Omaker Innovative Photoconductive Technology provides full spectrum lights & no ghosting, thus offering a more natural lighting experience. Premium Material Combination The light head is made up of ABS and Aluminum alloy enjoying perfect vision beauty and helps to dissipate heat. Convenient USB Charger Built Right In This desk lamp has a USB port with an output for easy charging of your smartphone, tablet or any USB powered device.